If you use a variety of Linux/Unix machines and are confused between their different keyboard layouts, it might help to learn the xmodmap utility. Xmodmap allows you to read the keyboard and mouse pointer bindings and to set them. You don't need root permission, and you can modify these without restarting the X session. This is very useful if you use different keyboards, or want to use the CAPS LOCK key for something useful. Keyboard code 24 corresponds to the 'q' key. Pressing the key by itself without any modifiers produces the 'q' key. If you hold shift while pressing it, it produces the 'Q' key. With the mode_switch and the shift, it produces the Unicode 0914 character (in hex). 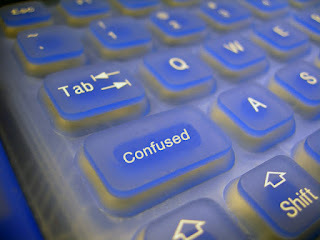 The mode_switch key is used on non-US keyboards to produce non-English text. If you don't know what it is, you don't need it. So that's the left shift key. $ xmodmap -e "command1" -e "command2"
To remove the Caps_Lock binding, we will remove the 'lock' modifier from it. Now Caps_Lock doesn't produce a shift lock anymore. You can also verify by opening a text window and pressing the caps lock key. It will not do anything. $ xmodmap -e "add Control = Caps_Lock"
$ xmodmap -e "remove lock = Caps_Lock" -e "add Control = Caps_Lock"
Easy remapping, and it works independent of the window manager, the keyboard type, and the version of Linux. XLookupString gives 1 bytes: (01) " "
XmbLookupString gives 1 bytes: (01) " "
I pressed a key which produces keycode 38. Using this method you can narrow down on an unused key and put it to good use.